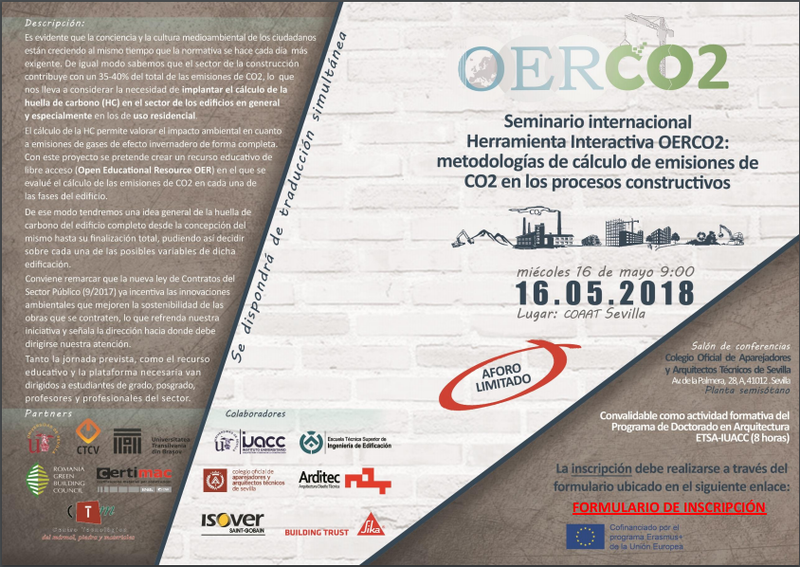 The next 16 May 2018, the OERCO2 project Final International Seminar will be held in Sevilla (Spain). The OERCO2 project aims at creating an Open Educational Resource (OERCO2) that unifies the calculations of CO2 emissions in each phase of the building construction, to get an overall picture on its footprint, starting with conception, and decide on each variable of the construction. OERCO2 intends not only to raise awareness, but also to make all entities involved in the construction sector conscious about CO2 emission, from the extraction of raw materials, production of construction materials to the demolition works or deconstruction of buildings, that is, considering the life cycle of materials and construction processes. RoGBC is a partner in the project.